Sri Lanka graduated to lower middle-income country status in 2010 because of the adoption of effective development policies. However, the country continues to struggle with the effects of a 27-year civil conflict that resulted in significant economic and social damage. Improvements in human development and the nutritional status of women and children have remained stagnant. The increased frequency of natural disasters like drought and flash floods worsens food and nutrition insecurity. Nearly 4.7 million people—23 percent of the total population—are undernourished, and underweight and anemia affect nearly a quarter of women and children. Almost 6.8 million people—33 percent of the total population—cannot afford the minimum cost of a nutritious diet. WFP has been present in Sri Lanka since 1968. As a result of the protracted civil war, the 2004 tsunami and a series of other recurrent natural shocks, WFP has implemented a series of emergency interventions and protracted relief and recovery operations to effectively respond to the more urgent and critical post-shock, recovery needs of the population. WFP aims to transition toward more holistic support of the Government’s efforts to address hunger and malnutrition and build resilience to climate-related shocks. 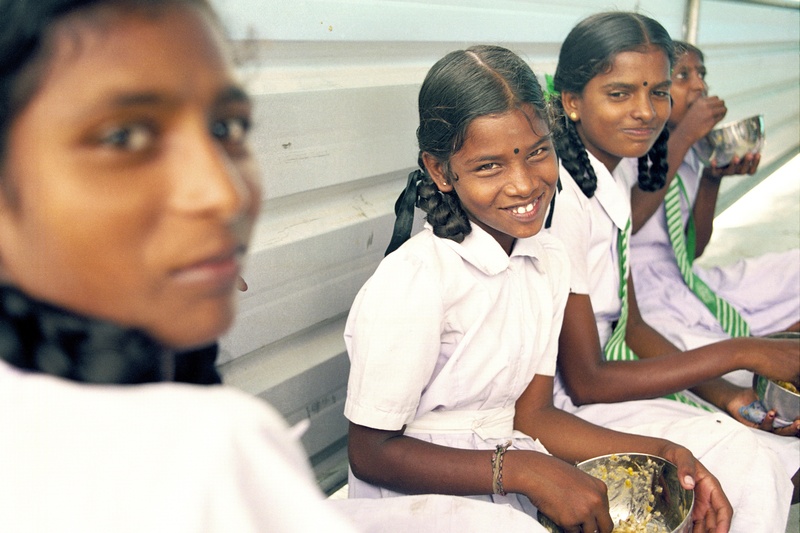 Nutrition – WFP works to reduce undernutrition among women and children. The UN agency focuses on the treatment of moderate acute malnutrition through targeted supplementary feeding for children aged 6 months to 59 months and pregnant and nursing women. WFP supports the Government in implementing its Multi-Sectoral Action Plan on Nutrition, through nutrition baseline surveys which promote food fortification and policy formulation, and continues to provide technical support to enhance the impact of Thriposha, a locally fortified blended food. School meals – This sturdy safety net for 160,000 children provides nutritious mid-morning meals in the northern province, contributing to increased attendance, retention rates and improved learning performance. WFP supports the Government in implementing homegrown school meals—linking schools to local farmers—and formulating a school meals policy. Climate change adaptation – WFP supports resilience building programs against climate shocks through adaptation measures. The UN agency’s Climate Change Adaptation Programme assists 14,000 farming families surrounding the Mahaweli River Basin, while the Climate Adaptation Management and Innovation Initiative enhances food security among vulnerable subsistence farmers, women’s groups and lagoon fishermen through improved and diversified livelihoods in the least resilient communities.